For each enchilada, spread 1/4 cup beans down center of tortilla. Top beans with 1/4 cup cheese. Fold 2 sides of tortilla up over filling; starting at bottom, roll up tortilla in enclose filling. Place 2 enchiladas in each of 2 shallow microwavable bowls or on each of 2 microwavable plates. 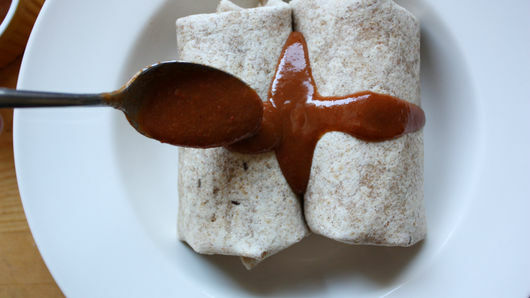 Top each serving with 1/4 cup enchilada sauce; sprinkle each with remaining cheese. Microwave each serving on High about 2 minutes or until cheese inside enchiladas is melted. Top each serving with sour cream and onions before serving. Need some meat? Add a couple tablespoons of shredded cooked chicken or beef to the tortillas before rolling them up. 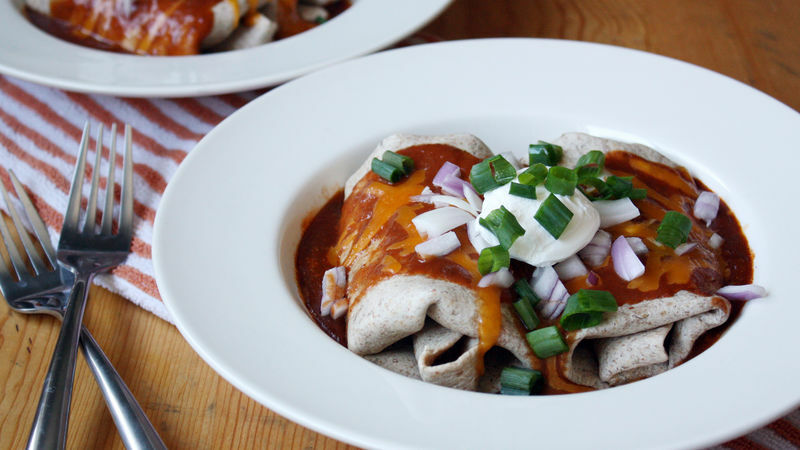 Spice things up by adding chopped jalapeños or a few drops of red pepper sauce to the enchiladas. Make breakfast enchiladas by adding cooked scrambled eggs to the tortillas.